Pizza Hut adds the new Stuffed Garlic Knots Pizza to their menu for a limited time. The new crust option features 16 hand-rolled, cheese-stuffed garlic knots embedded in the crust of a large pizza. A 1-topping Stuffed Garlic Knots Pizza goes for $12.99 and comes with two cups of marinara sauce for dipping. If the picture is any indication, the "knots" don't appear to be knots at all and look to be more like cheese-filled rolls. 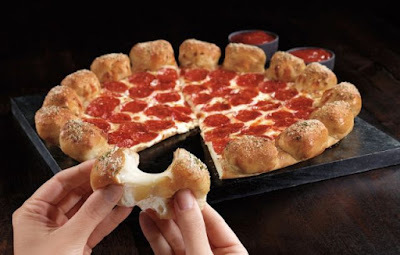 While Pizza Hut doesn't normally serve garlic knots, the concept is very similar to a Cheesy Bites Pizza brushed with their Hut Favorite blend crust flavor (their Garlic Buttery blend plus parmesan and herbs). If you end up liking this one, you can always just order a Stuffed Crust Pizza with the Garlic Buttery blend and just lose out a little on the dipping front.